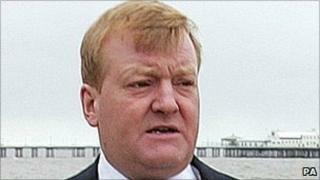 The Lib Dems will "soon get over" the divisions caused by tuition fees, ex-leader Charles Kennedy has said. Mr Kennedy, who rebelled over the issue, said it was "inescapable" that the party would suffer some political damage as a result of the row. He said the process had been "divisive" and he had not changed his mind that fees would deter poorer students. But he said he supported the coalition "in the broadest sense" and had confidence in Nick Clegg's leadership. Mr Kennedy was one of 21 Lib Dem MPs to vote against proposals to raise the tuition fees cap in England and Wales from £3,290 to £6,000 from 2012 and to allow universities to charge a maximum of £9,000 in some cases. He said he had always opposed tuition fees when he led the party and he had not changed his mind. "I have not changed my view that you don't want to disadvantage people from lower-income backgrounds being able to get to university on the basis of their merits not on their bank balances," he told the BBC News Channel. But Mr Kennedy - who is rector of Glasgow University - played down the impact of the row over fees on the Lib Dem's fortunes. "I think inevitably you get a bit of political damage when something like this happens, that is inescapable....but I think the party will soon get over that. I am not remotely concerned about that in a party political sense." Mr Kennedy said tuition fees was the only issue on which he felt the need to rebel. Asked whether he had confidence in Mr Clegg, he said: "Of course I do." Mr Kennedy was speaking after it emerged that students from England, Wales and Northern Ireland who go to university in Scotland could face annual fees of up to £6,000 as part of reforms of student finance there. The Scottish government is considering a number of options to tackle a funding gap in higher education, including a graduate tax and increased support from business and donations. But Scottish ministers have ruled out re-introducing up-front tuition fees for Scottish students. Mr Kennedy said he hoped a cross-party consensus could be reached on a funding model for Scottish universities and students which took into account the changes in England and Wales.